How did I miss this topic? Very impressive! 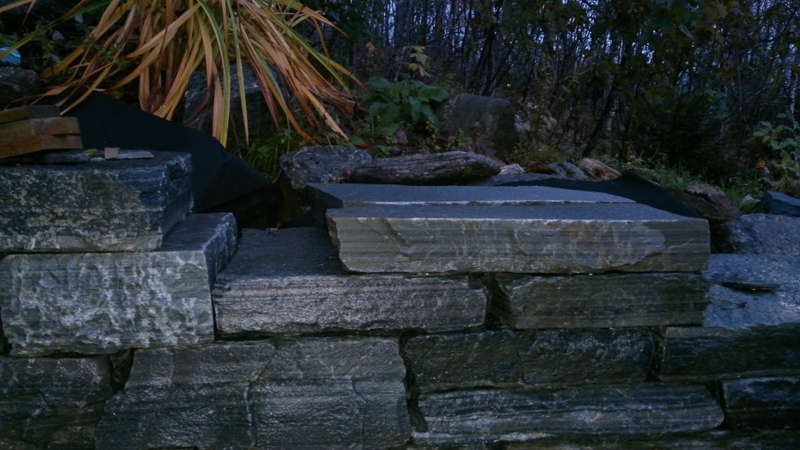 Both the stonework, so far, and the hand-hewn logs. A lot of hard work put into this project, I can see that. Look forward to seeing the final result. One year later, and the dry stone wall is still not completely finished... We're at a stage where the house/timber frame can be raised though, and according to the plan, we'll start work on that in a few days. Hopefully, that means I should have lots of new pictures to share with you later this week. That's a great finish. You did an excellent job! 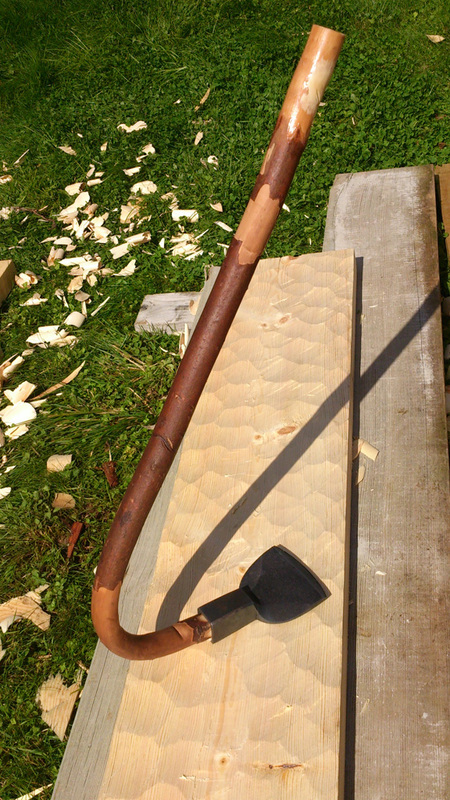 Here in Norway, and at least in this application, I think it's pretty unique, and even though this project is deeply rooted in local tradition, that's never a bad thing! I don't recall seeing it done here. That's still fantastic that you taught yourself how to do it. Puts my drilling holes into bottles without breaking them or hurting myself to shame. The last couple of weeks I've mostly been preoccupied with preparations and planning of the building's green roof, which we hope to finish sometime next week. In-between all the research and e-mails, I've still been able to get some much needed work done on the dry stone wall though. Two days later, I made a mock-up of a few possible sollutions, using a graphics editor (External url (7MB)). Then winter came and the dry stone wall was put on hold. Now, ten and a half months later, I finally completed the section today, but before I reveal the result, it would be interesting to hear how you would have done it, and which sollution you think I went for? I would have used cement. Lots and lots of it so it wouldn't fall over. Staggering the stones is a must for it to be sturdy. Perhaps doing a row occasionally facing the opposite direction. Or maybe I should pay as much attention to Yard Crashers as I do the Bath and Kitchen Crasher shows on hgtv. "Tracing" stones, where the stone's longest axis (strength) runs along the wall is something which should be avoided. There's no denying that it is a much faster, cheaper and easier way of building a wall though. The exception to this rule, as seen in the picture above, is the traced stones (depending on your perspective) often seen at corners/ends. This is why I don't build walls. I hire people to do things like that. I'll try to take a picture of the section of dry stone wall we finished last weekend soon, but today, I have something else to show you. That's the first sedum roof I've seen. It's nice! How does it handle cold weather? Do you have to water it if there's a drought? Please post pictures when it is in full bloom! Cold weather shouldn't be a problem as long as we don't get temperatures below the freezing point in the immediate future. Sedum is supposed to be able to withstand long dry spells, but this spring, summer and autumn it would probably have needed a little bit of watering from time to time. Usually, the climate is so humid here that watering shouldn't be necessary though, even with such a steep pitched roof. Any plans to treat it, if at all? Looks nice Sverre. I like how that method of preserving looks. New tools are awesome. Same applies to cookware and craft supplies. How does the siding look? Weather and real life stuff have made it difficult to work on the siding these past couple of months, but last weekend we finally had a chance to start on the siding for one of the gables. Since we've decided to try to avoid battening the gaps between each board, the live edges first had to be adjusted to match the one on the adjoining board. This turned out to be quite a tricky task, but eventually, we found a decent - but still VERY time-consuming - way of doing it. If I remember it, I'll try to document the process once we start on the next gable.